In years past, studios could have made the case of skipping the weekend after Oscar nominations in order to get out of the way of expanding films trying to capitalize on them. And while there are those films, the amount they're going to make this weekend is not the sort of thing you worry about, especially in the day of On Demand. Two films go wide this weekend but they're definite afterthoughts like in the old days of January. The Kid Who Would Be King at least has some decent talent behind it, with Attack the Block director Joe Cornish returning to kid-centered genre filmmaking. As the title would tip you off to, it's a take on Arthurian legend in a modern setting, with kids fulfilling roles as the knights of legend. 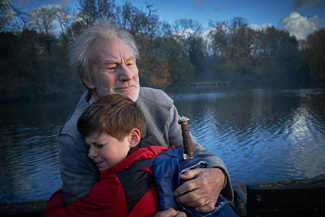 Louis Serkis (son of Andy) plays the lead, a bullied pre-teen with a stout heart who uncovers the fabled Excalibur sword and pulls it from its stone scabbard. This, you may recall, makes him the King of Camelot with all that entails, including great quests and battles. Possibly not ideal for a 12-year-old. With a bit of help from his “knights” and Merlin (played in part by Patrick Stewart, having a great bit of fun) they go off to fight the witch Morgana (Rebecca Ferguson) with some PG level fun. Reviews are actually pretty solid, but the heavy British bent to the film's cast and setting will make it a tougher sell on this side of the pond. Clearly the hope is to be something like the Percy Jackson movies, but without a book tie-in (yeah, yeah, you know what I mean), it's going be fighting for an audience that just isn't impressed. I'd expect around $12 million this weekend. Another British director, Steven Knight, is behind the weekend's other new release, Serenity (which is already one step behind for taking that title. I know it's been over a decade I won't let it go you can't make me). A noir-ish thriller, it stars Matthew McConaughey as a grizzled fishing boat captain at a resort, who in between banging the local rich lady (Diane Lane) and drinking himself into oblivion, finds himself wrapped up in a plot involving his ex (a blonded-up Anne Hathaway going full femme fatale), her abusive husband Jason Clarke and the son he left behind. Add in Djimon Hounsou and a strange, seemingly misplaced salesman (Jeremy Strong) and you have what seems to be all the elements of a Double Indemnity type operation.